This French classic from Brittany makes for a delicious casual lunch or supper. Two or three crêpes per person, plus a green salad and a glass of wine, constitutes an excellent meal. The batter proportions below are those of David Lebovitz, who issues the traditional caution that crêpe batter should rest in the fridge for up to a day before cooking. Rested batter does make for more flavorful, chewier crêpes, but I've found that cooking the batter as soon as you whisk it up makes perfectly good crêpes, too. If you prefer, you can make all the crêpes as single pancakes, then reheat them with the fillings as needed. Since I'm not a very adept crêpe-maker, though — my crêpes tend to rip and clump — I prefer to fill them as I make them. Which means this is a good meal for people who like to stand around the stove and eat hot things as soon as they come off the griddle. Make the batter: Put all the crêpe-batter ingredients into a blender and whizz to thoroughly blend. If you have the time, stick the blender full of batter in the fridge to chill for at least a few hours (if not overnight) and then bring the batter back to room temperature (give it another whizz in the blender to freshen it up) before cooking it. But if you're ravenous, just go ahead and make the crêpes. 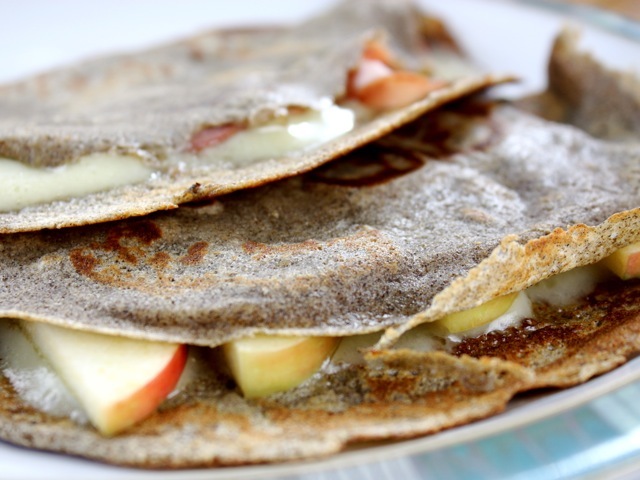 Cook the crêpes: Put a little batter into a nonstick skillet or a cast-iron pan. (If you're cooking for more than a couple of diners, use two pans at once.) Heat over medium heat until the butter is melted and starting to sizzle, then pour about a quarter-cup of the batter into the pan and swirl the pan around so the batter evenly coats the bottom of the pan. Quickly arrange your chosen fillings — for example, a slice of Swiss and a slice of ham — across one half of the crêpe, then carefully fold the empty half over the fillings, as with an omelet or quesadilla. Cook for a few minutes more, just until the cheese is getting melty, then tilt the pan to gently slide the finished crêpe out onto a serving plate. Serve immediately. Repeat as needed, using fresh butter in the pan each time, until the batter is gone. Stir the batter every so often (or whizz it in the blender again) to keep the flour from settling onto the bottom.